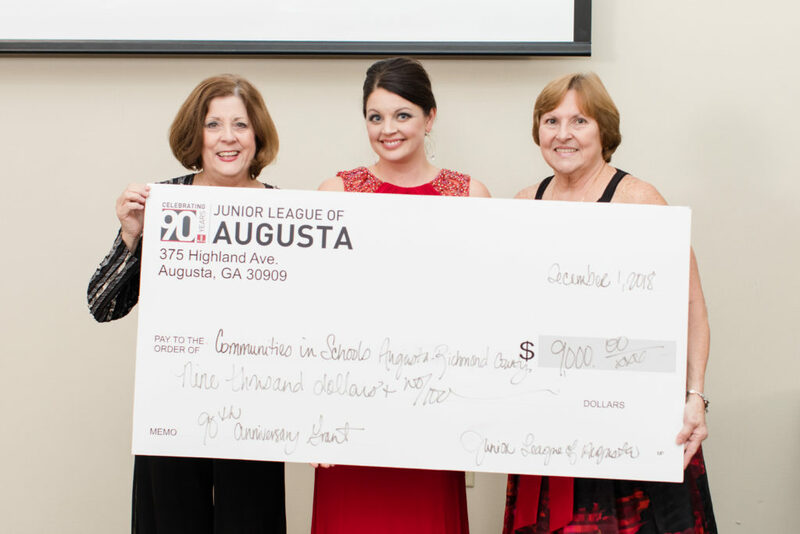 In honor of its 90th Anniversary, The Junior League of Augusta (JLA) awarded $9,000 to Communities In Schools Augusta/Richmond County on Saturday, December 1, 2018, at the Junior League’s 90th Anniversary Gala. The award will allow Communities In Schools Augusta/Richmond County to expand its existing services and programs supporting at-risk students to stay in school and on the path to a bright future. A large portion of the money will be used to establish and maintain “Essentials Closets” for RPM (Reaching Potential Thru Manufacturing), Hornsby Elementary, and Glenn Hills Elementary. CIS Augusta/Richmond County is a local nonprofit organization serving as a bridge between schools, businesses, and local organizations, identifying and mobilizing local resources to provide a range of services to students who need them. Services and programs include case management, tutoring, after-school programs, job shadowing, and basic needs. The Junior League of Augusta 90th Anniversary Gala was held at the Snelling Center. Barclay Bishop served as Emcee. The guest speaker was Vicki Floyd Clark of Memphis, TN. Clark has devoted the past 30 years building capacity in organizations and inspiring community and business leaders. She is a Senior Governance Consultant for BoardSource. To round out the celebratory evening, JLA was honored with a proclamation from the City of Augusta declaring December 1, 2018, the beginning of “The Junior League of Augusta, Georgia, INC. Day” in Augusta, Georgia. The League was recognized for its 90 years of service to women and children in the Augusta community. For more information about Communities In Schools Augusta/Richmond County visit www.cisaugusta.org.